FSLogix Apps enable virtual desktop admins to eliminate some of the biggest challenges facing VDI in RDSH by reducing the number of Windows Gold images, easing management for per-user applications, and optimizing license costs. This guide will walk you through how to install a Proof-of-Concept (POC) environment for RDSH Full Desktop with FSLogix Apps. 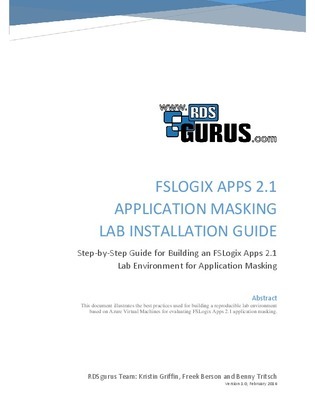 Download now for step-by-step instructions on the best practices for building a reproducible lab environment based on Azure Virtual Machines for evaluating FSLogix Application Masking.